I drive a 1965 Ford Galaxie. It gets roughly 11 miles to the gallon and it’s about 20 feet long. It’s made out of American Steel. It has a 390 engine in it and when something goes wrong, I open the hood and can almost instantly see what the problem is because the 390 is not a complicated engine. They have not made a car like this in decades. It is an antique. And I love driving it. A few weeks ago I was sent an invitation from a Public Relations company. They wanted me to attend an event in Tacoma where they were showcasing the Chevy Volt. I agreed to attend. The event was being held at Griot’s Garage on South 38th and Union. For those who have not been, Griot’s is to your car what Metropolitan Market is to your kitchen. If you want to wash your car and can’t stand the spray from a garden hose, Griot’s has a $134 nozzle that will give you the most even spray you’ve ever seen. Don’t get me wrong. Griot’s is an amazing place, but it’s not for cars you drive to work. It’s for cars you love. As I arrived at the event, I noticed a half dozen Chevy Volts and a table with a sign up sheet and various promotional materials. 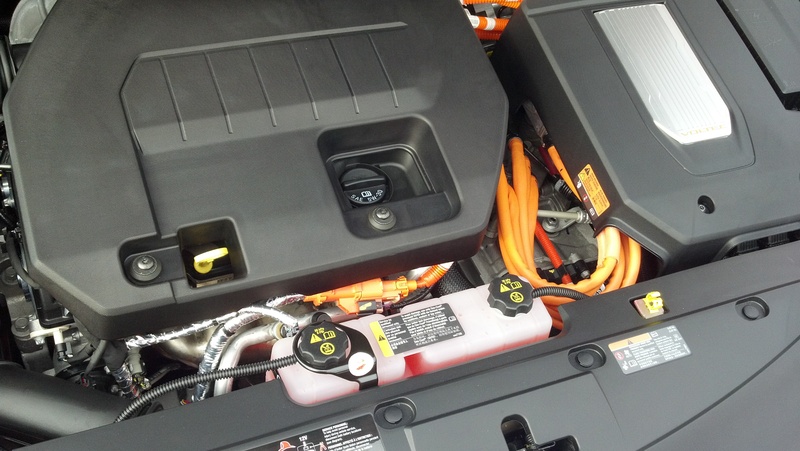 One Chevy Volt was by the table with its doors and hood open so you could inspect the vehicle. I signed in and mentioned the name of the person who invited me. I was told she was out on a test drive but that I should ‘definitely’ wait for her. I agreed and wandered around the display car. The first thing I noticed was that under the hood instead of an engine there was a X-Box. Later I would be told this was an electric engine with a gas powered generator. But looking at it, it appeared to just be a plastic box under the hood. In the trunk, there’s a gigantic extension cord with a standard plug in at the end. This immediately made me feel like this was a very large toy and not a real car at all. Eventually, Amanda arrived. Amanda was the one who had sent me the invitation. Amanda was probably fifteen years younger than me, blonde, and but not ditsy. In other words she was exactly the sort of person you’d want showing your product. As we got into the Volt, she told me about the various features of the car. When I get into my Galaxie, I have to pump the gas a few times, then turn the key, which turns the engine over and if it’s not too cold, it’ll start right up with that familiar rumble that lets you know you’re driving a big car that can kill people. 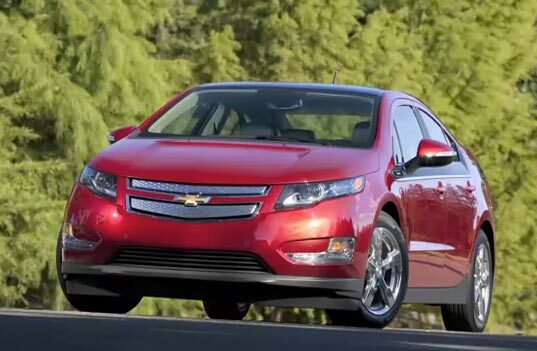 When you turn on a Chevy Volt nothing really changes. There are various readouts you can pay attention to if you like, but I was too busy being amazed that the car was now going in reverse out of the parking space and it was barely making a sound. The Volt even has a device that is basically a horn, but it’s not for people cutting you off. It’s to let people know that you’re there. I pulled into traffic and got the car going about 30mph. I noticed that the acceleration was quick and effortless. Amanda told me how the Chevy Volt has a 35 mile range. That’s 35 miles on pure electricity with a full charge. If you drive more than 35 miles, then the 9 gallon gas tank kicks in and uses a generator to create electricity for the engine. So even when you’re using gas, it’s still electric. She said that with the gas tank and a full charge you could go as far as 900 miles between charges if need be. She mentioned how there no transmission. Amanda gave me a look. “I…uh…don’t know.” I smiled, letting her know I wasn’t going to test it. She then told me about a feature the car has for stop and go traffic just as we were getting to a light. I shifted it into this mode and noticed that as soon as I took my foot off the gas pedal and the car braked just a bit. Once you got used to it, it was very nice. As we returned to Griot’s, I realized that this was basically a car from the future and my car was a car from the past. It was somewhat amazing that the two devices were both considered cars. In just about every way, the two vehicles are opposites. One is gas powered. One is electric. One is a Ford. One is a Chevy. One is from two years after JFK was killed. One is brand new. I thanked Amanda for her time and let her know that I would be writing about this. I love my 1965 Ford Galaxie. It’s a joy to drive. And even though it breaks down from time to time, I enjoy fixing it. (I just replaced a lower radiator hose on it.) And yet, I can’t help but be drawn to the Chevy Volt. It’s not a pretty car. I don’t particularly like the style, but the smoothness of the drive, the easy acceleration, and sheer user friendliness of it are almost intoxicating. At $34,000 I won’t be purchasing one anytime soon. However, I’d be freely willing to trade my 1965 Galaxie straight across for a new Chevy Volt. If Chevy were to agree to such a deal, I’d write about that too. But I won’t be holding my breath on that one. Word is that they’re barely able to fill orders for these cars as it is. Looks like you’ll be seeing lots more Chevy Volts on the street and if you look, from time to time, you’ll see one or two Ford Galaxies. This entry was posted in Reviews, Tacoma stuff and tagged Chevy Volt, Ford Galaxie, Griot's Garage. Bookmark the permalink. I too became interested in electric vehicles.However I was more interested in vehicles that were much more energy efficient than an electric car to get me from point A to point B though my needs were of a vehicle for more local use. The heavier a vehicle is the less efficient.When you drive a car or even electric car most of the energy is being wasted transporting the heavy mass of the vehicle versus the desired component (driver,rider,passengers or useful cargo).So what I did was to motorize a bicycle electrically (and legally) just for electric assist only up hills and pedal on level terrain or to coast down a hill. On my routes I only use 48 Watt Hours of electricity (only for assist up hills) to travel to my destination 4.5 miles away and probably use another 200 to 250 watt hours (or so) of human energy to pedal the rest of the distance. I have a Veltop inclement weather Classic + model accessory (Windshield with top cover and vinyl transparent side curtains) from France and I can ride my electric bike like a person can ride in a convertible car with the top up. In addition I have acquired a bike trailer and I too can haul 100 pounds of tools or a months worth of groceries in my bike trailer (I am going to motorize it too later on). However the most energy efficient useful vehicle is what’s known as a Velomobile and modern ones have a sturdy well protected Carbon Fiber composite and/or Kevlar body shell. Very crash resistant and protective.Formula 1 and Indy cars use those materials too for protection. Modern Velomobiles are the most aerodynamic and energy efficient vehicles out there getting around 1,000 mpg energy efficiency unlike my heavy electric bike which probably now only gets around 600.Aerodynamics plays a big role when travelling at higher speeds.They are also faster than most bicycles being enclosed recumbent trikes and offer total weather protection.They also can be motorized electrically too. However they are expensive at around $10,000 or so. Anyway I chose a much cheaper electric vehicle (bicycle) though I can’t use it on restricted highways.